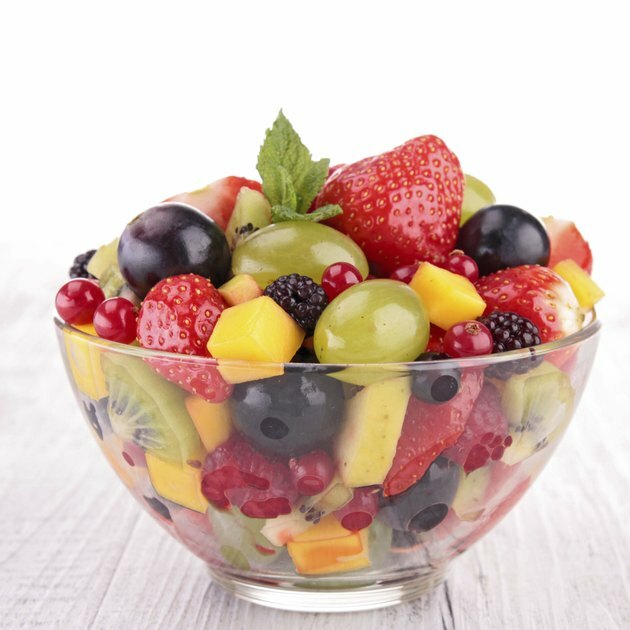 Fruit -- a naturally low calorie, low sodium food rich in fiber, potassium, and vitamin C, may be beneficial for decreasing risks of developing conditions such as high blood pressure, stroke, type 2 diabetes and may prevent some types of cancers, according to the USDA. In addition, the Harvard School of Public Health reports that consuming fruit on a regular basis, along with plenty of vegetables, may help prevent development of cataracts as well as intestinal conditions such as diverticulitis. The Dietary Guidelines for Americans recommends that most individuals should consume two cups of fruit or four 1/2-cup equivalent fruit servings a day. The Centers for Disease Control states that one large banana or orange, one medium grapefruit or pear, or one small apple is equal to a one cup equivalent serving of fruit. One large plum is equal to a 1/2-cup equivalent serving of fruit. A half cup of pureed fruit such as applesauce, or 1/2-cup of diced fruit, such as that found in canned or packaged fruit cup products, is equal to one, 1/2-cup equivalent serving of fruit. Whole fruits are convenient, portable snacks. Fruit serving equivalents for smaller and bunched fruit, such as berries and grapes, are measured in pieces. For example, the United States Department of Agriculture states that 16 grapes or 4 large strawberries can each count as a 1/2 cup equivalent fruit serving. In addition, 1/2 cup of diced strawberries or a 1/2-cup measure of blueberries or other smaller berries, is equivalent to a 1/2-cup equivalent fruit serving. Berries can be added to breakfast cereals, yogurt or blended into a smoothie. One small wedge of watermelon is equal to a one cup equivalent serving of fruit, while one medium cantaloupe wedge is equal to a 1/2-cup equivalent fruit serving. Melons make a great accompaniment to salads or eaten alone as dessert. The United States Department of Agriculture states that 1/4 cup of dried fruit, such as raisins, prunes, or dried apricots, is equal to one 1/2 cup equivalent fruit serving. Dried fruit can be eaten plain or sprinkled on salads or in frozen yogurt. Centers for Disease Control: Fruits &amp;amp; Veggies Matter: What counts as a cup? United States Department of Agriculture: Inside the Pyramid: Why is it important to eat fruit? Centers for Disease Control: Fruits &amp;amp; Veggies Matter: How many fruits and vegetables do you need?